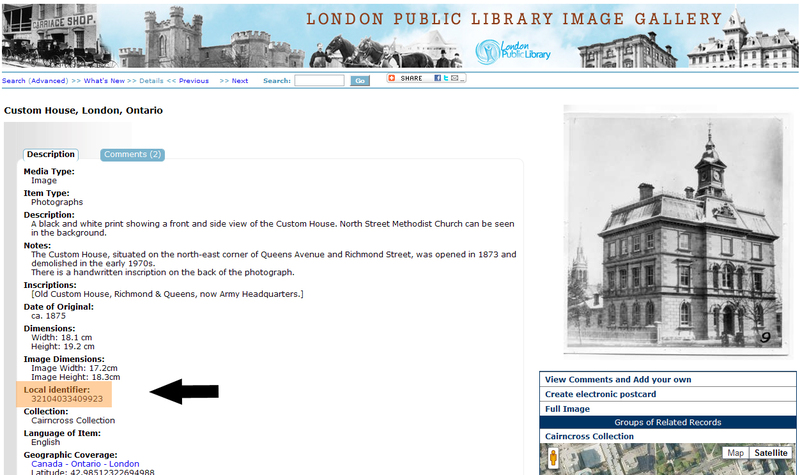 London Public Library (Ontario) provides access to images and indexes from its local history collection, including those housed in the Ivey Family London Room. The Ivey Family London Room Digital Collections contains hundreds of photographs of local buildings, businesses, and landscapes taken in the 1800s and early 1900s that were formerly tucked away in our archives. It also provides access to many of our indexes. Made possible thanks to the generous donation from Friends of the London Public Library. Make note of Local Identifier number - how to find it? Complete Image Request Form online and submit. Requests are handled in the order in which they are received. You will receive an email confirming your final cost. Orders are processed upon receipt of payment in full. You may choose to pick up your CD in person or have it mailed to you. All customers must agree to the Licensing Agreement. View a collection or take a walking tour from your chair through historic London from the 1860's onwards. Take the walking tour while strolling London's downtown by downloading the Historypin app from the app store for your iPhone, iPad, Android or Windows OS smartphone. You will be able to see the historic images layered over the current location using the app. Hint: After clicking on the image below, click on Slideshow then sit back and enjoy your travel through time.